Distinct Intranet Servers, which includes FTP Server, TFTP, LPD, and BOOTP bring quality server power to your network with no additional hardware investment. These servers allow you to make use of your PCs to share important services among your users. You can exchange files with the advanced Distinct FTP Server, share printers with LPD, facilitate network configuration with BOOTP and more. All these servers have an administrator login feature to protect your network setup from internal hackers. This is the ideal product to set up your internal FTP site. 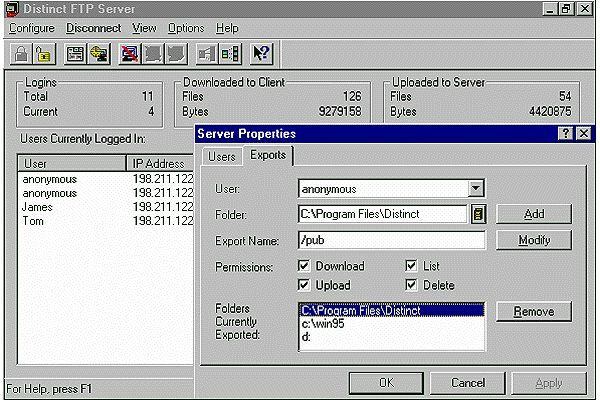 Distinct FTP Server turns a Windows 95, 98 or NT system into a powerful file server which allows downloading or uploading of files across your organization or across the Internet. Put the files that are for general distribution on the FTP Server and let any visitor using an anonymous FTP client come in and get them. Use password protected FTP accounts for those files that are for restricted distribution. The Distinct FTP Server lets you remain in control allowing you to define access to multiple folders on a per user basis, create customized banner files for your visitors, broadcast shutdown warnings or disconnect unwanted visitors. Reduce your hardware investment by sharing your current printers. Just install LPD on a PC and turn it into a network printer server. Any other system on the network running the Distinct network printer driver or any other LPR-based driver capable of printing to an LPD server can use Distinct LPD as its print server. You can even use the same PC running LPD for other tasks as it does not have to be dedicated to just handle the printer. Distinct LPD allows you to monitor the print queues, enable or disable spooling, configure job priorities. All in real time. With the BOOTP and TFTP utilities you can boot routers and communication servers off your PC. Your job as network administrator is simplified as you can use a single database to provide each system on the network with its IP address, system name, serial number, subnet mask and domain name server. Includes statistics for number of files uploaded/downloaded, users currently connected, total connections made, etc. View full product documentation for Distinct Intranet Servers: FTP Server, TFTP, BOOTP and LPD. Distinct Intranet Servers: FTP Server, TFTP, BOOTP and LPD.